There’s more to Detroit than Motown and Motor City. 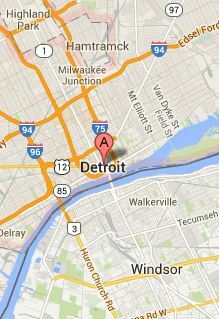 Situated on the USA/Canadian border formed by the Detroit River, Detroit is a major port city. Where there is a port, there plentiful needs for Detroit forklift training. For companies in the Detroit region, OSHA compliance is a big deal. But who has the time & money to handle their own Detroit forklift certification? Not many can, and that’s why CertifyMe.net is a popular option for forklift certification in Detroit. Our training courses offer affordable, on-point OSHA compliance for any forklift driver in Motown and all over Michigan. Sign up today with CertifyMe.net, and we’ll guide you through all your Detroit forklift certification needs. Detroit is the third largest steel-handling port in the United States. More than $30 million has been invested in revitalizing the area, making it a great place to hire workers with forklift certification in Detroit. CertifyMe.net keeps your company compliant, all while making sure forklift operators have the proper training to perform safer on the job. With our Detroit forklift certification, it’s a win-win for everyone involved! Check out our courses, and sign up today – you won’t be disappointed! Detroit offers many possibilities for forklift operators. From the Detroit Windsor Tunnel to other companies doing commerce with nearby Canada, Detroit has a promising economic outlook – and CertifyMe.net helps ensure your employees are equipped to handle all important forklift jobs! If you need a forklift certification in Detroit, whether at the docks, the airport or in a warehouse, CertifyMe.net has your entire training and compliance program ready to go. What’s stopping you? Click here to find out how you can get forklift training and certification in Detroit. For any questions about our Detroit forklift certification, or if you’d like to sign up today, click here or give our OSHA compliance experts a call at 1-888-699-4800. We look forward to helping with your forklift certification in Detroit!